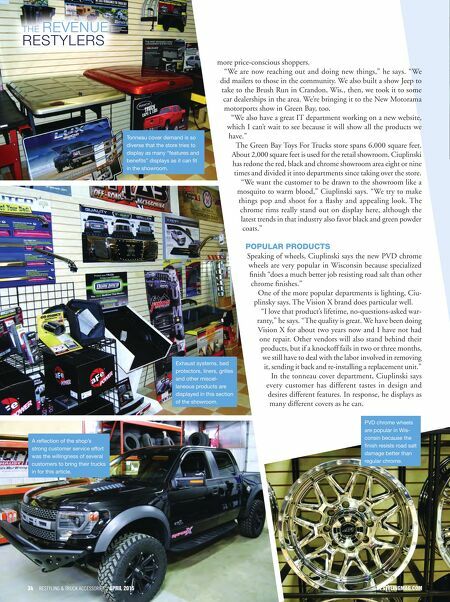 restylingmag.com April 2015 | Restyling & tRuck AccessoRies 35 When it comes to truck caps, Ciuplinsky has a clear favorite. "The Z Series by A.R.E. stands apart from everything else," he says. "It's probably the cleanest looking and most aerody- namic cap, but Ranch is another brand that we like and carry that's been very good for us." 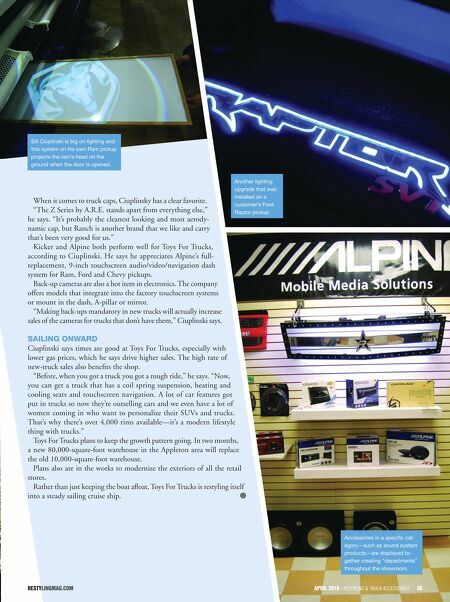 Kicker and Alpine both perform well for Toys For Trucks, according to Ciuplinski. He says he appreciates Alpine's full- replacement, 9-inch touchscreen audio/video/navigation dash system for Ram, Ford and Chevy pickups. Back-up cameras are also a hot item in electronics. The company offers models that integrate into the factory touchscreen systems or mount in the dash, A-pillar or mirror. "Making back-ups mandatory in new trucks will actually increase sales of the cameras for trucks that don't have them," Ciuplinski says. Sailing Onward Ciuplinski says times are good at Toys For Trucks, especially with lower gas prices, which he says drive higher sales. The high rate of new-truck sales also benefits the shop. "Before, when you got a truck you got a rough ride," he says. "Now, you can get a truck that has a coil spring suspension, heating and cooling seats and touchscreen navigation. A lot of car features got put in trucks so now they're outselling cars and we even have a lot of women coming in who want to personalize their SUVs and trucks. That's why there's over 4,000 rims available—it's a modern lifestyle thing with trucks." Toys For Trucks plans to keep the growth pattern going. In two months, a new 80,000-square-foot warehouse in the Appleton area will replace the old 10,000-square-foot warehouse. Plans also are in the works to modernize the exteriors of all the retail stores. Rather than just keeping the boat afloat, Toys For Trucks is restyling itself into a steady sailing cruise ship. April 2015 | Restyling & tRuck AccessoRies 35 Bill Ciuplinski is big on lighting and this system on his own Ram pickup projects the ram's head on the ground when the door is opened. Another lighting upgrade that was installed on a customer's Ford Raptor pickup. Accessories in a specific cat- egory—such as sound system products—are displayed to- gether creating "departments" throughout the showroom.